Tales from the mouths of creatures, great and small – dogs, stoats, tigers, rats and more. Who is really man’s best friend? Special Guest Robert Shearman (who wrote one of the top 50 Doctor Who episodes of all time), reads A Joke In Four Panels. Opportunities to chat with the authors, buy books, and other delicacies we might bring along, And of course to join in with Flash from the floor – come prepared or write in the interval – 100 words fiction or poetry on the subject of animals. Robert Shearman reads from Tiny Deaths. ; Steven Hall reads from The Raw Shark Texts. For anyone interested in edgy, wildly imaginative fiction and fantasy. Robert Shearman will read from and discuss Tiny Deaths, his first collection of short stories, just shortlisted for this year's World Fantasy Award. He is well-known as a writer on the hugely popular Christopher Eccleston series of Doctor Who. Steven Hall’s debut novel, The Raw Shark Texts, caused a feeding frenzy among publishers and has lived up to the hype, drawing comparisons with Paul Auster. Robert Shearman is a LibraryThing Author, an author who lists their personal library on LibraryThing. Robert Shearman's book A Book of Horrors was available from LibraryThing Early Reviewers. Robert Shearman's book Visitants: Stories of Fallen Angels and Heavenly Hosts was available from LibraryThing Early Reviewers. 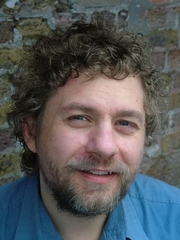 Robert Shearman is currently considered a "single author." If one or more works are by a distinct, homonymous authors, go ahead and split the author. Robert Shearman is composed of 4 names. You can examine and separate out names.